It is a 12W Adapter/Power Supply Module/Voltage Regulator/Auto Buck Boost Converter, Input voltage: .. It is a 12W Buck Voltage Regulator/Car Converter/Power Supply Module, Input voltage : DC 9~60V, Outp.. It is a 150W Car Adapter/Voltage Regulator/Power Supply Module, Input Voltage: DC 12V/24V(wide volta.. 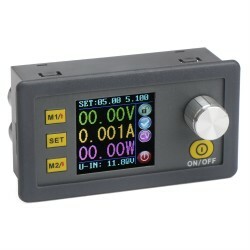 Specific: Input Voltage: DC 4.5~27V Output Voltage: DC 1.3V~25V (step-down mode, th.. It is a 15W Dual USB Power Supply/USB Charger/USB Adapter, Input voltage: DC 8~20V, Output voltage:.. It is a 15W Adapter/Micro USB Charger, Input voltage: DC 8~22V, Output voltage: DC 5V, Output curren.. It is a 15W Adjustable Voltage Regulator/Power Supply Module/Charger/Adapter, Input voltage: DC 7~35.. It is a 15W Buck Voltage Regulator/Adapter/Car Converter, Input voltage: DC 8~55V, Output Voltage: D.. It is a 15W Power Adapter/Voltage Regulator/Power Supply Module, Input voltage: DC 8~22V, Output vol.. It is a 15W Power Supply Module/Voltage Regulator/Adapter, Input voltage: DC 12V/24V (9V~35V), Outpu.. It is a 15W Power Converter/Adapter/Power Supply Module, Input Voltage: DC 4.5~27V, Output Voltage: .. It is a USB Adapter/USB Charger/Driver Module, Input voltage: DC 8~22V, Output voltage: DC 5V, Outpu.. It is a 15W Buck Voltage Regulator/Car Converter/Power Supply Module, Input voltage : DC 9~60V, Outp..